The TIPA Toolbox is a set of templates, spreadsheets and other documents, which can be used by the assessment team to perform a TIPA assessment. The TIPA Toolbox provides 20 tools to perform a standard, structured, objective, and repeatable assessment of IT Service Management processes. 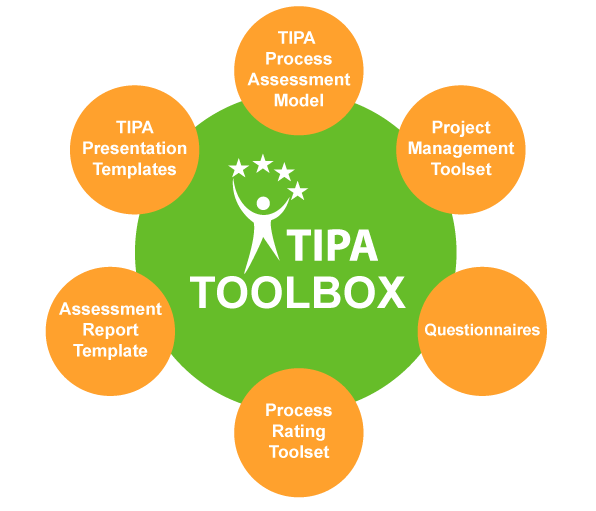 The TIPA toolbox gathers methodological and IT tools for supporting the main stages of a TIPA assessment. All TIPA Certified Assessors are free to use this toolbox for performing their TIPA assessments. TIPA PROCESS ASSESSMENT MODEL The Process Assessment Model (PAM) is the standard description of all ITIL processes used in the TIPA framework. The Process Assessment Model contains the standard description of the processes against which the assessment is performed. It describes the purpose of the each process, its expected results, its typical activities and its standard inputs and outputs. PROJECT MANAGEMENT TOOLS The TIPA project management tools are used at the beginning of a TIPA assessment to understand the context, the scope and the objectives of a given TIPA assessment, as well as to plan relevant interviews and document reviews. These tools also help the Lead Assessor organize and manage the assessment project. RATING TOOLS The TIPA questionnaires and rating tools are used during the assessment activities performed within the assessed organizational unit (i.e., document reviews and interviews). These tools enable the assessment team to collect all the necessary information in order to provide an actual and objective “snapshot view” of the assessed processes. TIPA ANALYSIS AND ASSESSMENT REPORTING TOOLS The TIPA analysis and assessment result tools are used during the last activities of an assessment for formalizing and structuring the analysis, and the final assessment result and report.